Members Only Live Class Schedule for handwriting analysis tutoring class. – Handwriting University: Learn Handwriting Analysis and Graphology. Our tutoring live classes are hosted by our Handwriting University President, Bart Baggett as well as our Certified Graduates and Authorized Trainers. Topics such as: relationships and compatibility, handwriting analysis trait stacking, criminal handwriting, and much more. 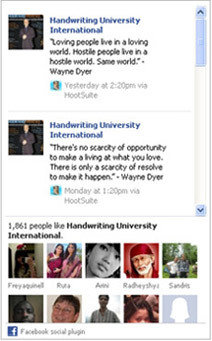 This is a small group class where you join in and analyze handwriting samples together. You can upload your own samples, or samples that you have come across. You can ask questions… there is no stupid question. so look below for the next upcoming class and join in! The links below are for MEMBERS ONLY. You must login and be a current Silver Member to listen in or view the class replay page. Bart Baggett Class #37 Watch replay now. Bart Baggett Class #47 Tutoring Class with lots of good samples Click here to listen & view to replay now. * Best class of the year! Click here to listen or watch the 90-minute class replay. Bart Baggett Class #67 More Crazy handwriting samples. Click here to watch video replay or download audio replay. Live class and your handwriting samples. Click here listen to the audio replay. Amazing in-depth class with lots of stuff not taught in books. Click here listen to the audio replay. Video Replay Click here view the video replay of the training. Bart Baggett Class #75 Live class and your handwriting samples. Click here listen to the audio replay. Bart Baggett Class #76 Video Replay. Bart Baggett Class #78 – Video. Click here to view the replay. Bart Baggett Class #79 Click here to watch the video replay. Monday, April 03rd, 2017. Click here watch the video replay. Monday, April 24th, 2017. Click here to watch the video replay. Monday, May 22nd, 2017. Click here view the video replay. Monday, August 28th, 2017. Click here to watch the video replay. Monday, September 25th, 2017. Click here to watch the video replay. Monday, November 27th, 2017. Click here to watch the video replay. Monday, December 18th, 2017. Click here to watch replay. Monday, March 26th, 2018. Click here to watch the video replay. Monday, April 30th, 2018. Click here watch the video replay. Monday, May 21st, 2018. Click here to watch the replay. Monday, June 25th, 2018. Click here watch the replay. Monday, August 27th, 2018. Click here to watch the video replay. Monday, September 24th, 2018. Click here to watch the replay. Monday, November 26th, 2018. Watch the Video Replay Now. Monday, December 17th, 2018. Click here watch the replay. Monday, January 28th, 2019. Click here to watch the replay. Monday, February 25th, 2019. Click here to watch the replay. German writing. Cultural differences. Class characteristics. Click here to watch replay now. Monday, April 29th, 2019. Click here upload your samples and register for this live event. Monday, May 27th, 2019. Click here upload your samples and register for this live event. Monday, June 24th, 2019. Click here upload your samples and register for this live event. Monday, July 29th, 2019. Click here upload your samples and register for this live event. Monday, August 26th, 2019. Click here upload your samples and register for this live event. Monday, September 30th, 2019. Click here upload your samples and register for this live event. Monday, November 25th, 2019. Click here upload your samples and register for this live event. Monday, December 16th, 2019. Click here upload your samples and register for this live event. How to Attend These Live Classes or Download the Replays. 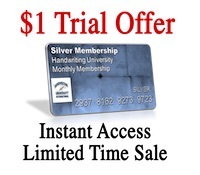 Only active Handwriting University members with Gold or Silver memberships are able to attend these live classes. Once classes are completed, they are available for download or stream in the members only live event area. So once you have a paid membership, not only will you be able to attend these classes, but you can also listen up to 3 months of previous classes. Each month, members are also able to access to new bundle of PDF, audio, and video bonus trainings each month inside the Member’s Only section of this website Any questions about your membership status, call our customer support center or submit a customer support ticket via the help menu. If you are unable to upload your handwriting sample, please email JPG to support @ handwriting university.com at least 4 days before class, so we can have tech support make sure we can upload and see your handwriting sample. We do not work on weekends and classes are usually the last Monday night of each month. Next Post: Certification Level Students and Graduate Live Community Class Schedule.